Dentures have been the tried-and-true method for replacing lost teeth for many years. Evidence shows even the ancient Egyptians wore them. Today, restorative dentistry has evolved considerably to include more sophisticated options, such as bridges and dental implants, but some patients still prefer the benefits dentures and partial dentures have to offer, such as affordability, ease, and treatment speed. Here at Water’s Edge Dental in South Daytona, we can create specialty dentures for your unique mouth that will replace your missing teeth and restore much-needed form and function to your smile. Full dentures are meant to replace either your entire bottom row of teeth or upper row, and they’re designed to fit comfortably inside each patient’s unique mouth. They stay in place with the help of natural suction; in some cases, patients may also find that a little dental adhesive adds additional support and stability. 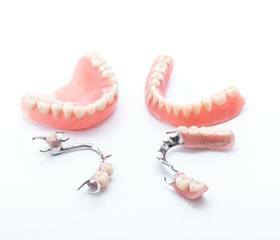 Full dentures are removable as well, meaning that they can be taken out while sleeping or when brushing or flossing in order to maximize comfort. Partial dentures work a little differently than full dentures. Instead of consisting of a full set of false teeth, Dr. Sean Bannan takes into account your existing teeth and the gaps that need to be filled when designing your customized restoration. Thus, your partial denture is somewhat similar to a puzzle piece, in that it slides snugly over the open areas of your smile. Partial dentures are attached to your mouth with the help of clips or brackets. Although they strongly resemble dental bridges, they are different in that they can be removed just like full dentures. Patients may choose to pursue full or partial dentures over dental implants for several reasons. Some patients are not viable candidates for dental implants; others may find the cost too prohibitive. The dental implants process, while transformative, can also be quite lengthy, especially if bone grafts are needed. Dentures, on the other hand, can be created over a much shorter turnaround time, which may be ideal for patients who are seeking quick relief for tooth loss. Other patients like that they’re removable, which makes cleaning them a much easier job. At Water’s Edge Dental, you can attend a free consultation with Dr. Bannan so that you can discuss your needs with him and decide together which tooth replacement solution you feel would best work for your unique situation. Your satisfaction is our team’s top priority! Contact Water’s Edge Dental today to schedule an appointment. We can’t wait to give you a reason to smile! Located in South Daytona, FL, we also serve the areas of Daytona Beach, Port Orange, Holly Hill, Ormond Beach, Edgewater, and beyond. Fill out this short form and we’ll be in touch. Copyright © 2018 Water’s Edge Dental | Sitemap | Site designed and maintained by TNT Dental.